Jonas Müthing was born in 1985 in Winterberg. His musical education began with the guitar and the double bass, before he began working on harmony, counterpoint and musical analysis as well as composition intensivly. After three years of studying the double bass at the music universities in Karlsruhe and Frankfurt he therefore changed his main subject and began music theory studies in Karlsruhe with Michael Moriz and Uwe Kremp. During this time his main fields of studies were ancient music, choral music of the 19th century and composition. Master classes with Markus Jans and Dominique Müller as well as participation in composition seminars with Wolfgang Rihm complement his education. In 2014 Jonas Müthing graduated from the Högskola för scen och musik in Göteborg (Gothenburg), where he studied for a master’s degree in composition with Ming Tsao and Ole Lützow-Holm. 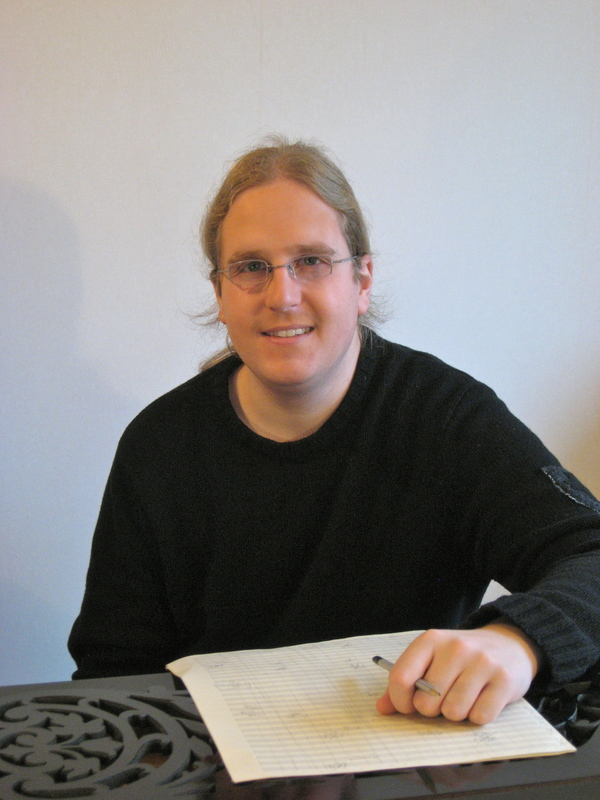 Currently he is working as a double bass, music theory and composition teacher at the Borås kulturskola. Apart from that he sings in two chamber choirs. In his compositions Jonas Müthing focuses on music for choir as well as orchestra. Several musicians and ensembles commissioned pieces from him such as the Swedish National Orchestra Academy, Die Meistersinger and Musikschule Ettlingen. Due to outstanding achievements he was awarded a scholarship by the Friedrich-Ebert-Stiftung. He also recieved Ale kommuns kulturstipendium in 2011. Apart from his studies Jonas Müthing was occupied as a research assistant at the Max-Reger-Institut in Karlsruhe and as teacher for music theory. Additionally he works as freelancing double bassist and composer and together with Annedore Hacker and Uwe Kremp he performs in Galgenliederabend, a cabaret performance based on the poetry of Christian Morgenstern.